Apart from the claim that “Allah” is the name of the moon god, the Christian missionaries also tend assert this claim by questioning why do Muslims use the crescent symbol as a symbol for their religion, or why is the moon being used in Islam to mark a new month. 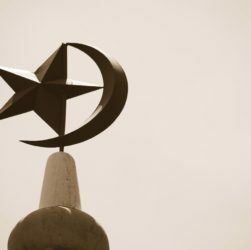 They engage into the logical fallacy of equivocation, that since Muslims use the crescent as the symbol of Islam, therefore it follows that Muslims worship some kind of “moon deity”. This is no more truer than claiming that since Judaism adopts the Star of David symbol, it follows that the Jews considers it as an object for worship, or that Christians worship the Crucifix since it is used as its symbol. This paper would attempt to explain the significance of the moon in Islam, insha’allah.